"A lively, readable, believable, and truly vital book for managers at all levels in enterprises of all types and sizes. ... Read this book." —David A. Jones, Co-founder and Chairman Emeritus, Humana Inc.
After more than 30 years of working in and managing television stations, Bill Lamb has learned first-hand that running a business is a complex endeavor with many moving parts and conflicting agendas. But he has also learned that at every successful organization's core are some simple, basic principles, the most basic of which is that Money Follows Excellence. Bill has had success at each level of his career, and every sales team or organization he has managed has grown both market and revenue share. It didn't happen by accident. It was a result of a disciplined application of the principles he shares in Money Follows Excellence. In this instructive and insightful new book, Lamb suggests that managers, if they hope to be successful, must ground their organization's core principles in a solid foundation and ensure — always — that excellence comes first. "This book vividly illustrates the facets and essence of great leaders, who build great teams, who know it all starts with a great culture. Every chapter is a must-read." —John Schnatter, CEO and Founder, Papa John's International, Inc. He advises managers to forget about being number one (a short-term goal) and to focus instead on being the best, which will lead to long-term sustainability. He stresses the importance of developing the right culture in an organization, and shares his own experiences and advice on how to change a bad culture into a great one; how to convert a group of disparate people into an enthusiastic team; and how to take calculated risks that can reap great rewards. Lamb also demonstrates how to shed the vice-grip of skilled and powerful competitors by changing the rules and, sometimes, even the game itself; and he suggests when you should ignore what customers are telling you and trust your own experience and gut instincts. 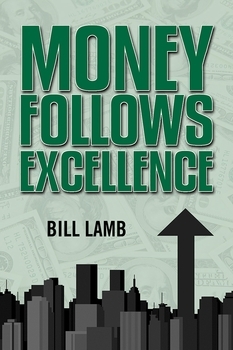 Bill Lamb's Money Follows Excellence is sprinkled with stories and interesting examples of how the organizations he has managed and the teams he has quarterbacked have seen their quest for excellence translate, time and time again, into success, industry awards and, most importantly, personal pride and self-satisfaction in the workplace. In the words of John Schnatter, CEO and Founder of Papa John's International, Inc., "Every chapter is a must-read." "Based on his own remarkable career, Bill Lamb has written a lively, readable, believable, and truly vital book for managers at all levels in enterprises of all types and sizes. He shows clearly how leaders can and must create the conditions which allow all team members to do their best work, be recognized for it, and be held accountable for doing it. Read this book. You'll love it, as I did!" —David A. Jones, Co-founder and Chairman Emeritus, Humana Inc.